Congratulations to Vicky Humphrey (@jorjafoxluvr) for correctly answering the trivia questions and winning the signed copy of Lost Girl, season 1! 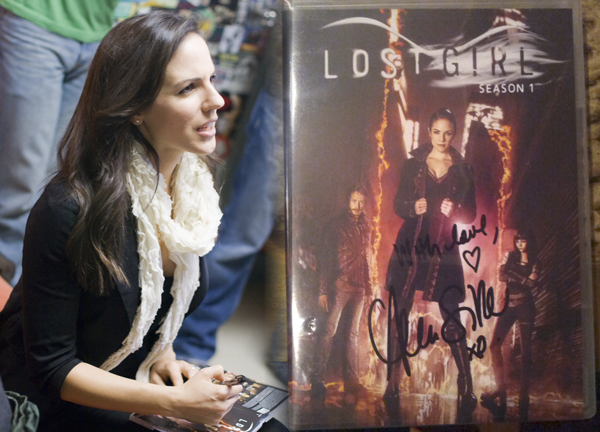 Would you like to win a signed copy of Lost Girl, Season 1? All you have to do is listen to Epic on November 16th and 23rd when we interview Anna Silk and her husband, Seth Cooperman. Answer the following questions and email them to us at epicchsr@gmail.com to enter the draw. – What is the name of the Jewish boy band that Seth was part of? – What discipline does Anna have a university degree in? – Which one of Anna and Seth’s cats required welding gloves when being passed through airport security? Competition closes on November 30th and the winner will be announced the following day. Competition is only open to Canadian residents. Well, maybe not necessarily Canadian residents.. We can only ship the DVD’s within Canada. So as long as you can get them at a Canadian postal address, that’s all that really matters. So Give’r. did you guys pick a winner yet? Yes, we have. We’re waiting for a response from the winner right now. When she responds and verifies her information, we will post her name here.